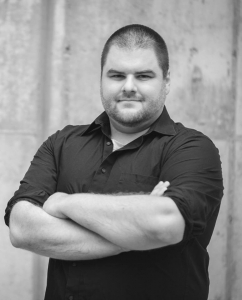 Congratulations to Andy Gagnon, current MFA in Music Composition student and winner of the 2018 TURNmusic Collegiate Composition Prize. Andy is a native of Hardwick, Vermont who has worked across the world as a performer, composer, and educator. His music has been performed from the clubs of New York and Boston to the concert halls of China and the music festivals of Colombia. As an educator, Andy has worked at The Governor’s Institute on the Arts, The Vermont Jazz Camp, U-32’s summer jazz camp, the Get Thee to the Funnery camp in Barre, and the Green Mountain Youth Symphony Summer C.A.M.P. He has also served as a composition mentor for students working with Music-COMP. He currently teaches instrumental, vocal, and general music at Stowe Middle School and instrumental music at Stowe Elementary School. Andy regularly performs with The Renegade Groove, The Vermont Jazz Ensemble, and PURPLE feat. Craig Mitchel, which won recognition from The Seven Days for being voted the best tribute band in Vermont. He has served as a sideman and studio musician for a wide variety of artists including Ray Vega, Eugene Uman, Dennis McNeil, Eric Lindberg, Elizabeth!, and Myra Flynn. TURNmusic offers a fresh, new type of a hybrid concert experience that brings more of the community together to celebrate. Conductor Anne Decker has mixed her musical tastes to create a unique set of performances. TURNmusic performs music that is defined by quality–not by genre–to present professional music concerts in a relaxed venue, and to offer affordable ticket prices. Andy’s piece I Found The Way will be performed on November 1 at 8:00pm at FlynnSpace in Burlington, VT and on November 2 at 8:00pm at Rusty Nail Stage in Stowe, VT.